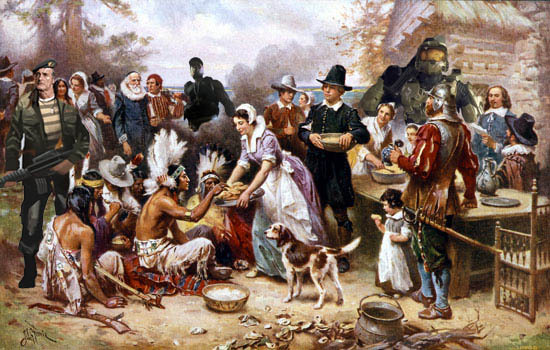 Today is Thanksgiving in North America. It's a holiday about family, friends, and togetherness. Most importantly it's a holiday about giving thanks for the things in life we may take for granted. So to celebrate we thought we'd give thanks for co-op gaming, and the staff each weighed in on the subject. Nick - "I'm thankful for everyone of our readers and community. I'm thankful that there's plenty of other fine people out there who love cooperative gaming just as much as I do. I'm thankful for split screen co-op WITH online. A game like Halo 3: ODST wouldn't be the same without it. Plus grunts look like Turkeys"
Jason - "I'm thankful for all of you ladies and gentlemen out there that make a site like Co-Optimus possible. By choosing co-op and making your voice heard, you're letting the games industry know that co-op gameplay always has been, and always will be, something more than a bullet point on the back of a box." Jim - "I'm thankful for an M21 EBR with thermal scope and a Glock 18 with iron sights. Consider Burger Town defended. I'm also thankful for my darling family and for the Co-Opticrew. These people - and the awesome community here - are incredible in so many ways." Mike - "I'm thankful for the awesome staff at Co-Optimus, our community and those who tune in every fortnight to listen to the Co-Opticast. I am also thankful for the following: Xbox Live, whoever put together all the great references in Borderlands, Halo 3: ODST, coffee, Adobe Photoshop, our community again (for not mocking my PSPgo purchase, though Jason decided to so he's getting a lump of coal for Christmas), my wife (and impending child, neither of who will take exception to their position on this list), Sharpie markers, Torchlight, four-day weekends, Left 4 Dead 2, Fantasy Flight Games, Samsung HDTVs, the Nintendo DS and Viewers Like You. Also cats." Marc - "I'm thankful for my family and friends, a good job, and for our new home. We are very blessed. I'm very thankful for Co-Optimus, my fellow staff members, and the community of users here. My gaming time is better now that I have so many great people to share it with. It's been good for me personally to be an editor, as it lets me flex my creative muscles in ways I wouldn't otherwise be able to. Also, I'm thankful for huge pectoral muscles. The feature I am most thankful for is family filters. I'd never have been able to play as much Gears 2 without it!" Kat - "I'm thankful for alternate co-op modes: After you've played through the story with your buddy, you have to wonder "what now?" With survival modes, or other co-op challenge modes give us a fair amount of replay value for those times when you just want to jump in with some friends and play Halo 3: ODST, Gears of War 2, or even Ghostbusters survival mode. Also for the great staff and community we have at Co-optimus, so we don't have to dredge through the general scum of Xbox Live and PSN." What aspect of cooperative gaming are you most thankful for?